After the patients have been evacuated, the hospital is free to succumb to its own mortality. In the throes of its disintegration it makes a mockery of the order and hygiene formerly attempted within. The buildings themselves give in to their contamination. Behind closed curtains, the hospital changes into its own funeral parlor. Confronted with remnants of suffering, the task of performing a hospital autopsy can be grim. Yet its anatomical model provides an unprecedented insight into the machinery that awaits our own deterioration. As it was forbidden centuries ago to peek inside a dead body, we are likewise now told that the innards of these institutions are things we are not meant to see. But here we not only like to play by different rules but invent an entirely new game. 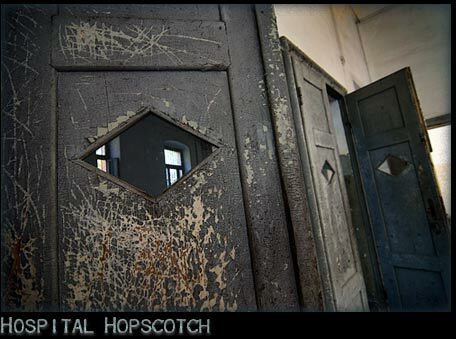 Hospital Hopscotch, for instance, could be played by reassembling as many layers of this corpse as are available: a patient's gown, a vial of dried blood, a half-completed Rorschach test. Death leads to renewal. From the stained base of the autopsy table, perform a one-legged leap into the more colorful recesses of your imagination. Where you'll end up, only you can know.